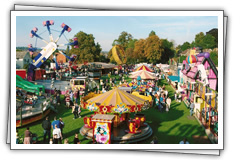 John Wall & Son Pleasure Fairs was established in 1881 by Wall Brothers of Farnborough, Hampshire. Todays family fun fair ride hire business is based at Hook in Hampshire and supplies rides, attractions and catering to parties, corporate events, weddings and military events. 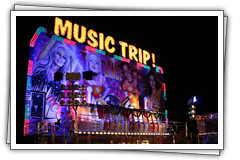 From one ride to a complete fun fair with catering, we can provide everything you need for a successful event. 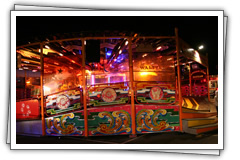 We have been hiring out our fun fair rides and outdoor catering facilities for over 25 years and have built up an excellent reputation for providing first class fun fair equipment with a full gold standard service. When you hire our fun fair rides we offer free advice and take care of everything from start to finish allowing the organiser to move on to other important issues of the day. We offer a friendly professional service and all our staff are trained in customer care and wear smart uniforms for easy identification when assistance is needed by your guests on the day. We're proud to offer a fun fair hire service that's available any time, any place, any where - if it is possible, we can do it for you. We work directly with our clients, cutting out any middle man fees, keeping your costs low and improving efficiency as you work directly with the fun fair ride owner. All of our fun fair rides and attractions hold Public Liability Insurance cover for £10 Million per item together with a full risk assessment, copies of all documentation are provided for your records. We proudly serve Hampshire, Berkshire, Wiltshire, London, Surrey and Sussex and can help wherever you are in the UK. © Copyright John Wall & Son Pleasure Fairs Limited 2013. All rights reserved. Site by inception2 Web Design Hampshire.